Families of the Missing interrogates the current practice of transitional justice from the viewpoint of the families of those disappeared and missing as a result of conflict and political violence. Studying the needs of families of the missing in two contexts, Nepal and Timor-Leste, the practice of transitional justice is seen to be rooted in discourses that are alien to predominantly poor and rural victims of violence, and that are driven by elites with agendas that diverge from those of the victims. In contrast to the legalist orientation of the global transitional justice project, victims do not see judicial process as a priority. Rather, they urgently seek an answer concerning the fate of the missing, and to retrieve human remains. As important are livelihood issues where families are struggling to cope with the loss of breadwinners and seek support to ensure economic security. Although rights are the product of a discourse that claims to be global and universal, needs are necessarily local and particular, the product of culture and context. 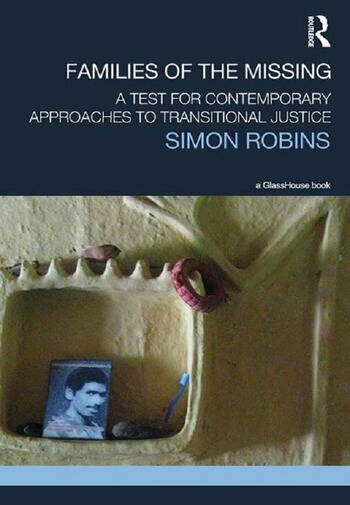 And it is from this perspective that Families of the Missing seeks both to understand the limitations of transitional justice processes in addressing the priorities of victims, and to provide the basis of an emancipatory victim-centred approach to transitional justice.